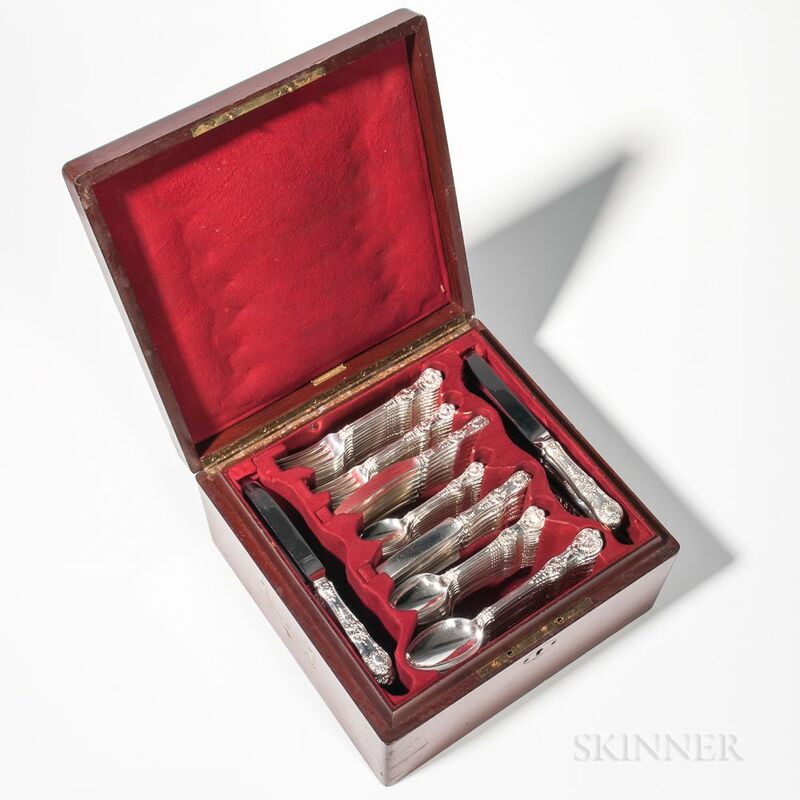 Tiffany & Co. "English King" Pattern Sterling Silver Flatware Service, New York, late 19th century, monogrammed, eighteen each: dinner forks, hollow fish knives, dinner spoons, and hollow dessert knives; seventeen hollow dinner knives, sixteen luncheon forks, fifteen dessert spoons, fourteen teaspoons, and thirteen soupspoons, approx. 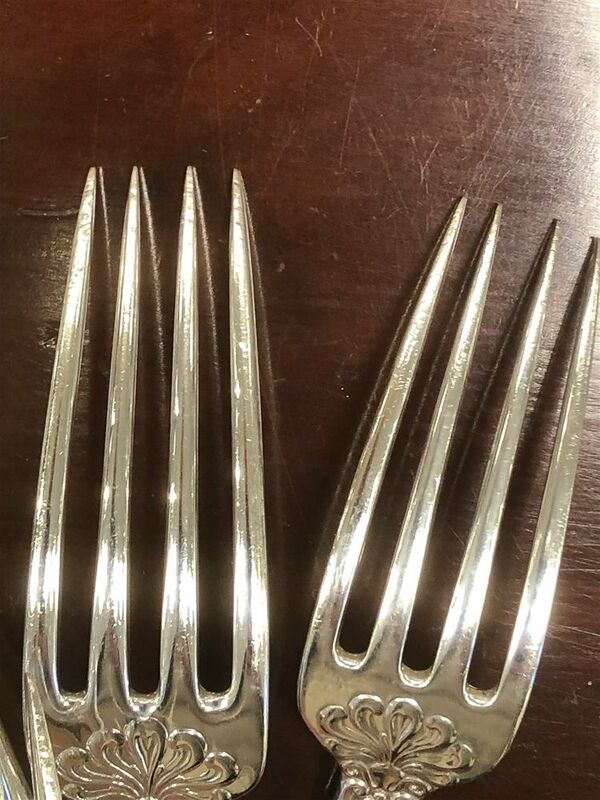 258.6 troy oz. 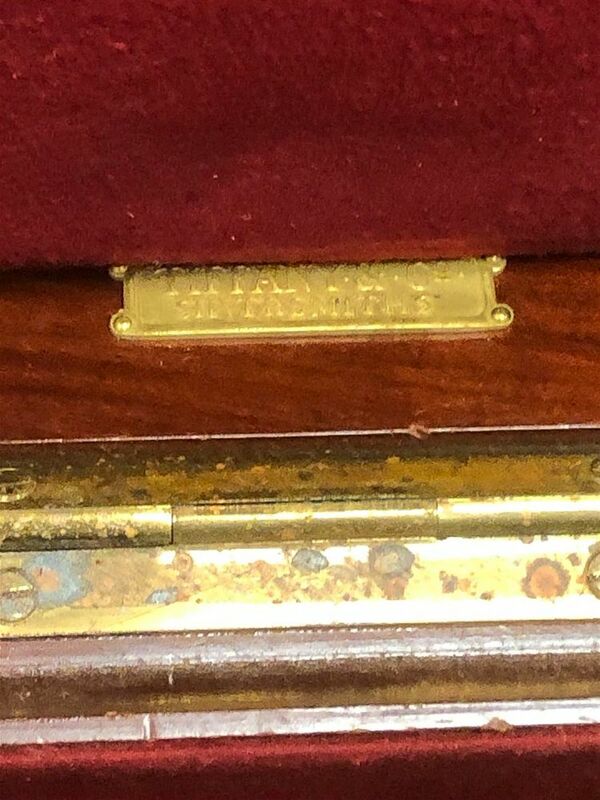 weighable silver, in a Tiffany mahogany case. 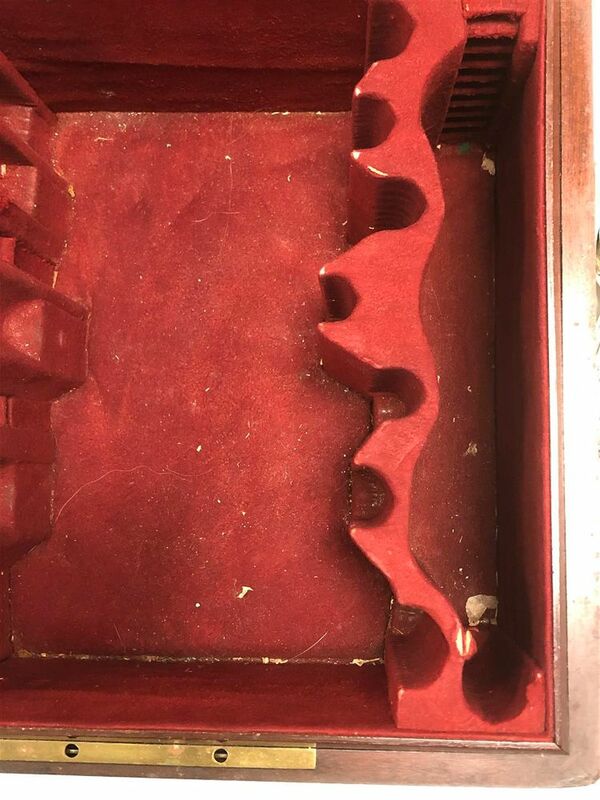 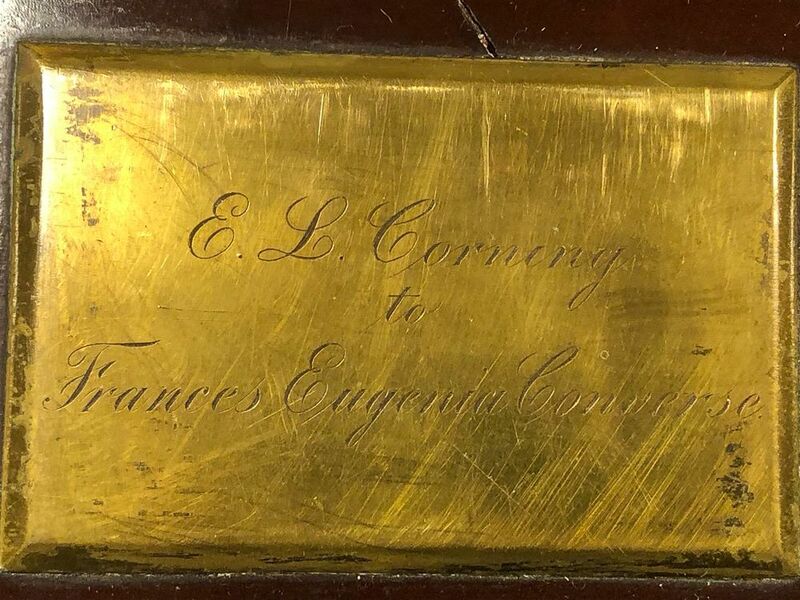 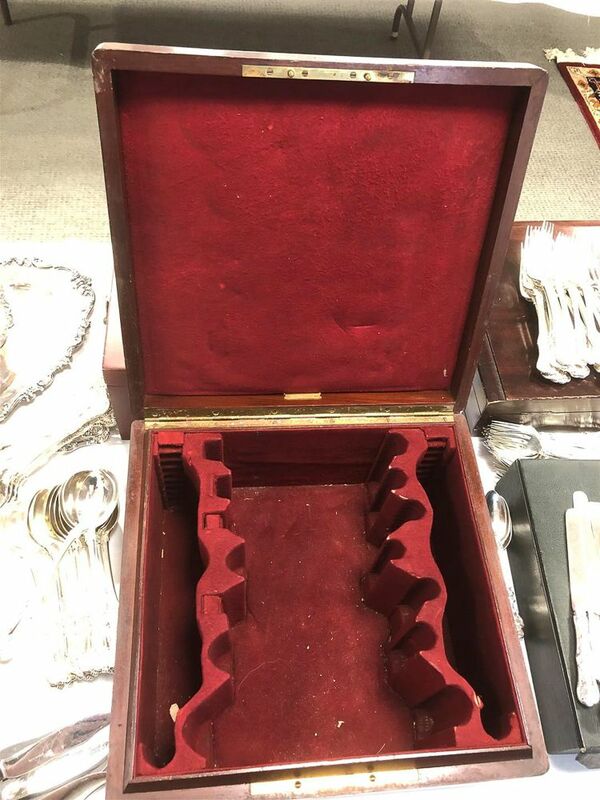 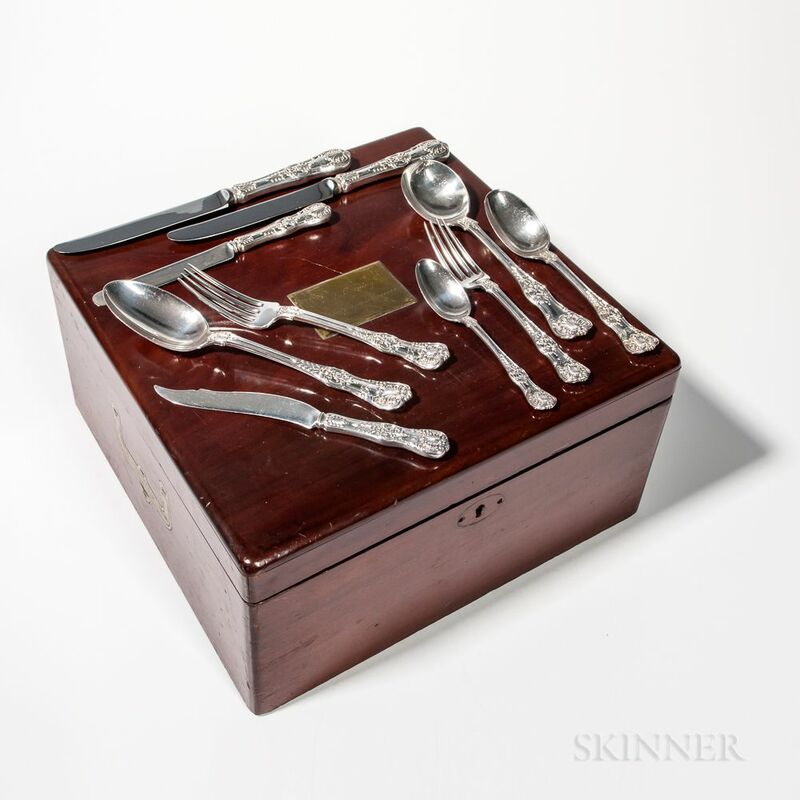 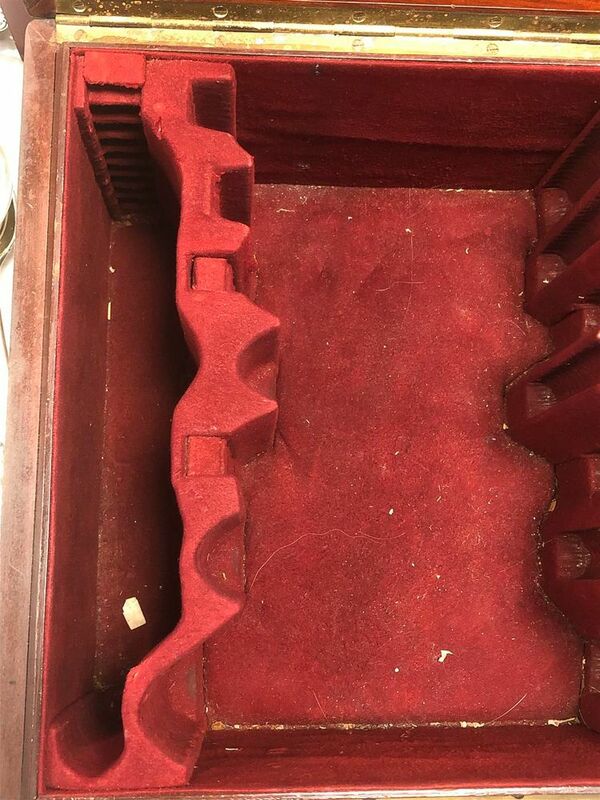 Marked Tiffany case, with abrasions, minor tears to lining, nicks to edge, minor corrosion to interior hinge (slots for 7 different utensils 18 pieces each -knives each have two slots for 9 pieces), lacking front escutcheon and key (case in locked position). 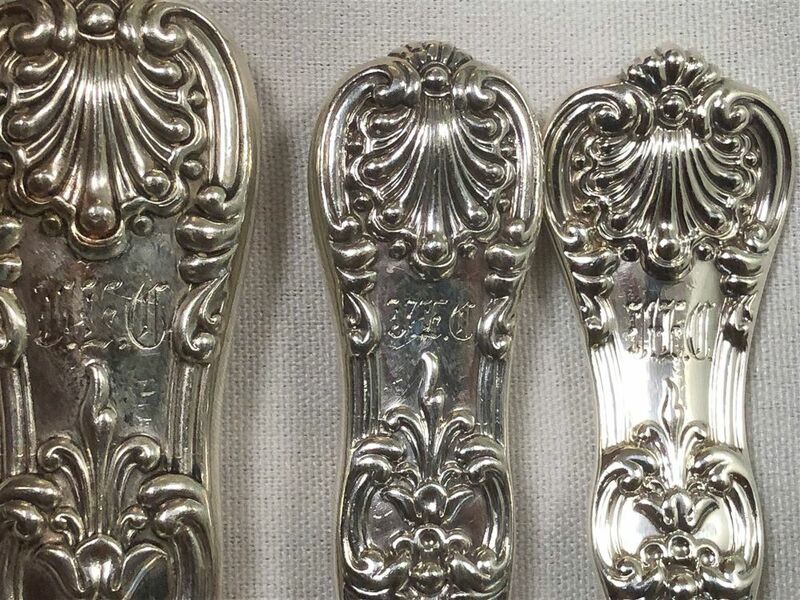 Soupspoons lacking monogram, one with bent handle. 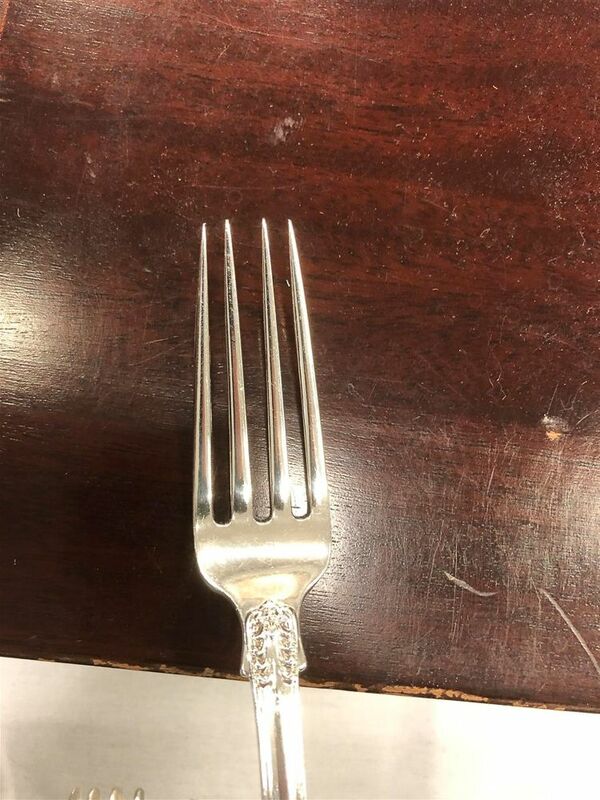 One teaspoon handle bent slightly. 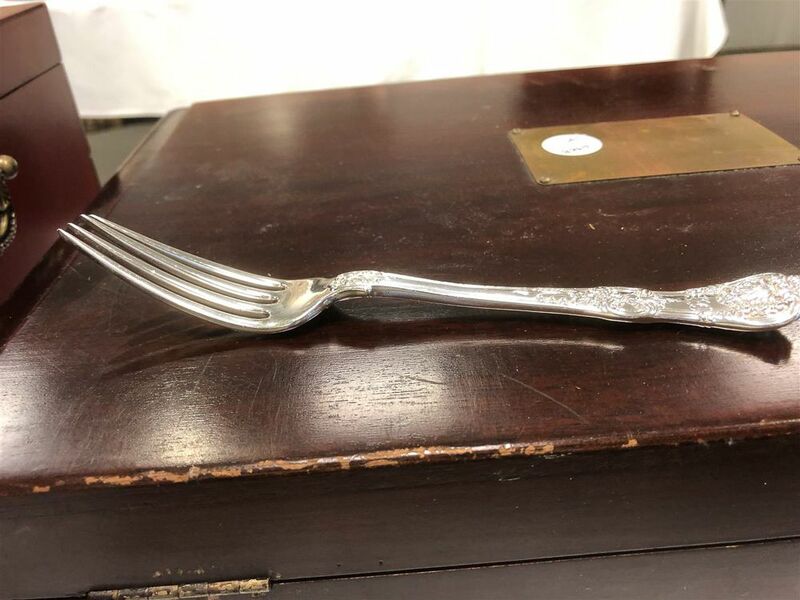 Forks all with visible usage wear nicks and abrasions to tines, some tines bent slightly, one luncheon fork with handle and one tine bent out of alignment. 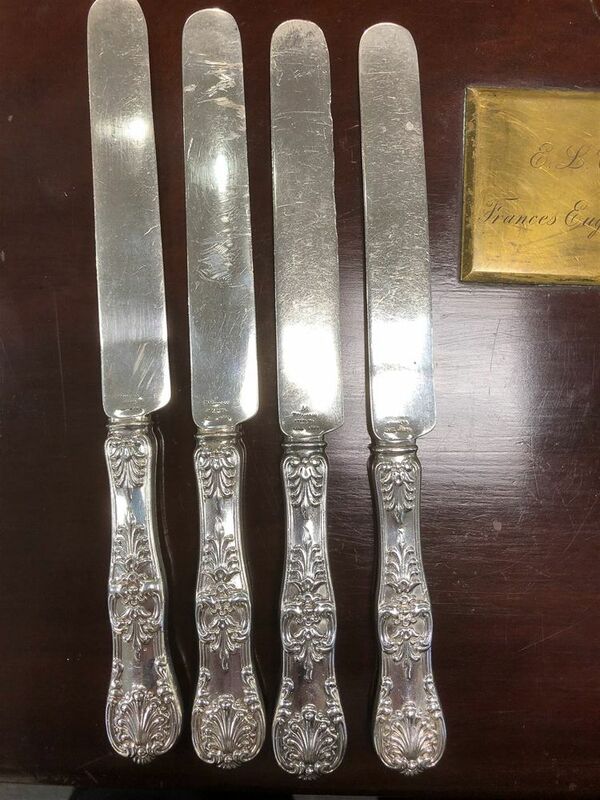 Dessert knives with sterling blades (date mark M: 1885-91), all with usage wear abrasions, two with linear dent to blade, one with deeper abrasions, and a fourth with nicked losses to edge. 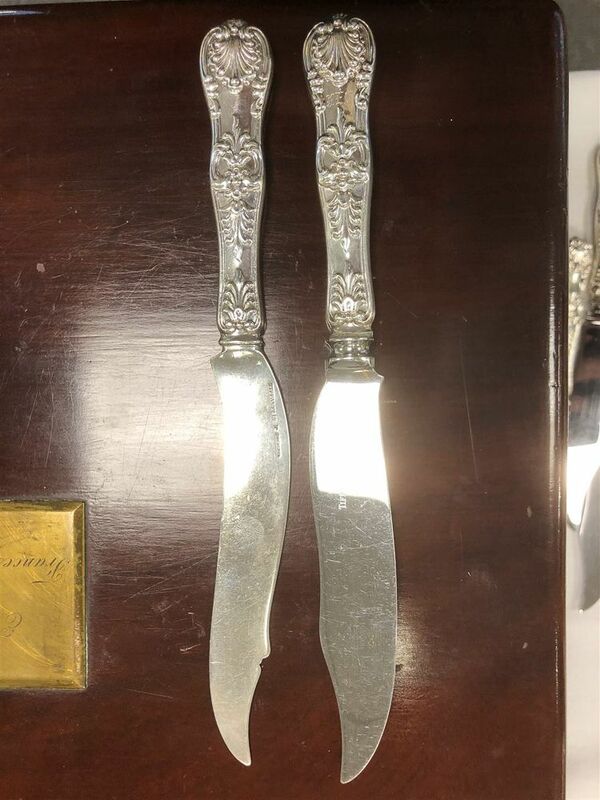 12/18 fish knives with original sterling blades (T date mark 1902-07), six with replaced stainless steel Tiffany blades. 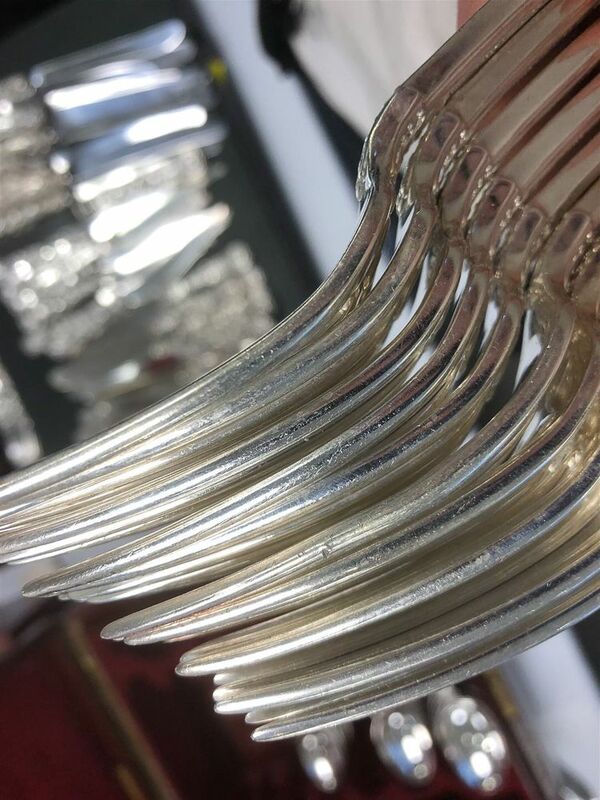 Dinner knives with replaced Reed & Barton stainless steel knives. 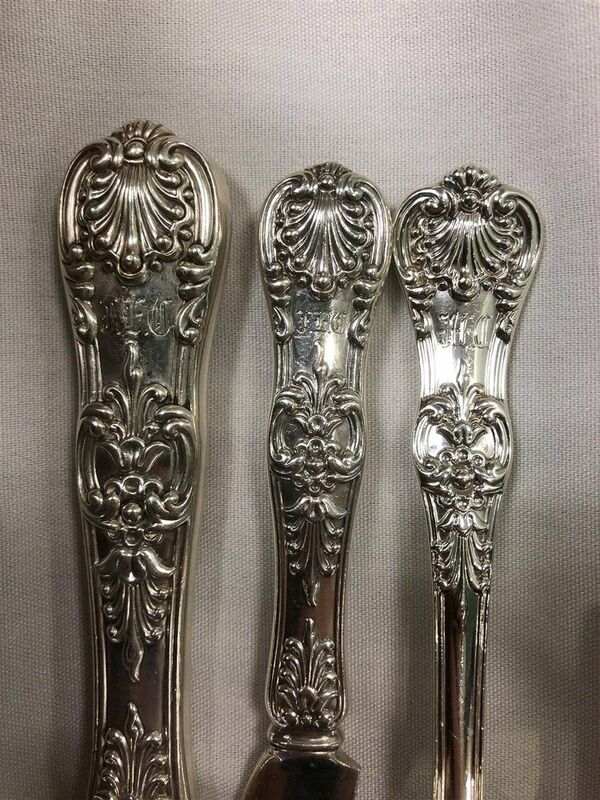 Many hollow handled pieces shallow dents to handles.